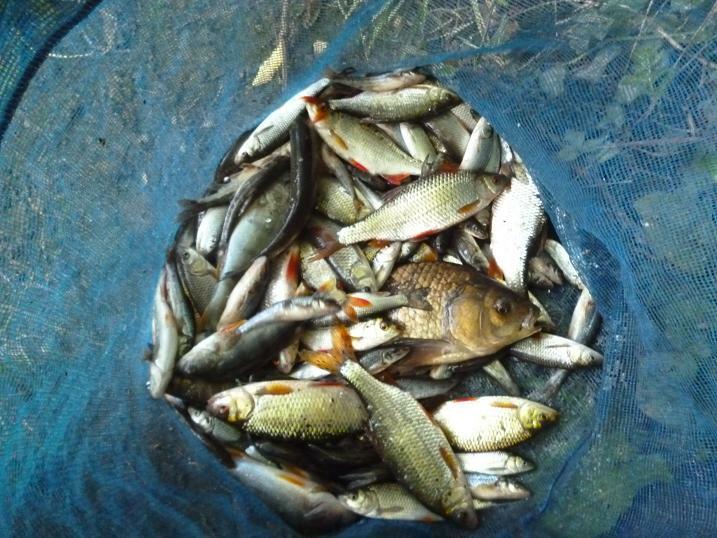 Stick float nets a mixed bag from the weir. Left over red maggots in my fridge were beginning to turn to casters and with my mother’s words, “Waste not, want not” ringing in my ears, I took some equally left over cooked hemp seed from the freezer and drove the two miles down to my urban river. Usually a winter venue for me, where big roach and chub are the target, I was interested to see what the warm weather would bring. The river flows left to right into the fast flowing outfall from the town water treatment works, the plan being to feed heavily with the maggots and hemp, with the occasional introduction of sweetcorn, in an attempt to attract the carp, that are known to inhabit the stream, although I had yet to catch one. 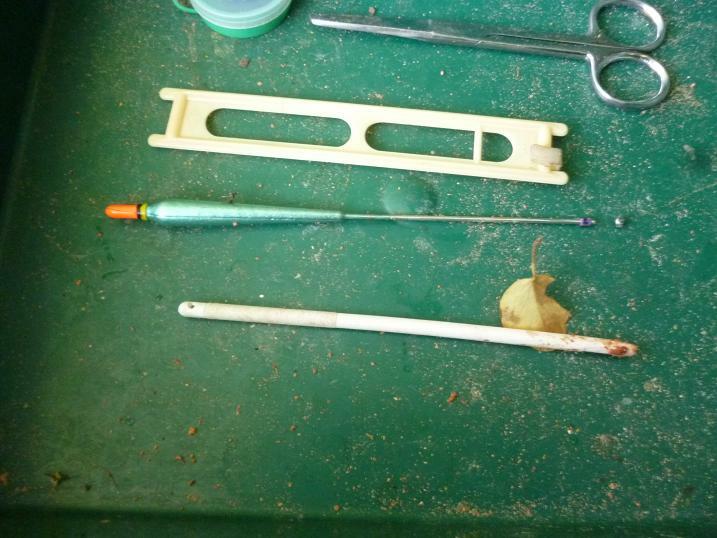 I set up my 14 ft match rod with a 5lb main line loaded ABU 501, the 4 No. 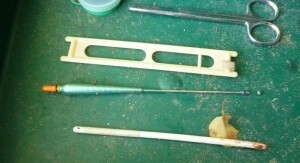 4 ali stick having a 3lb hook link to a size 14 barbless, more than enough to cope with any sudden runs I thought. 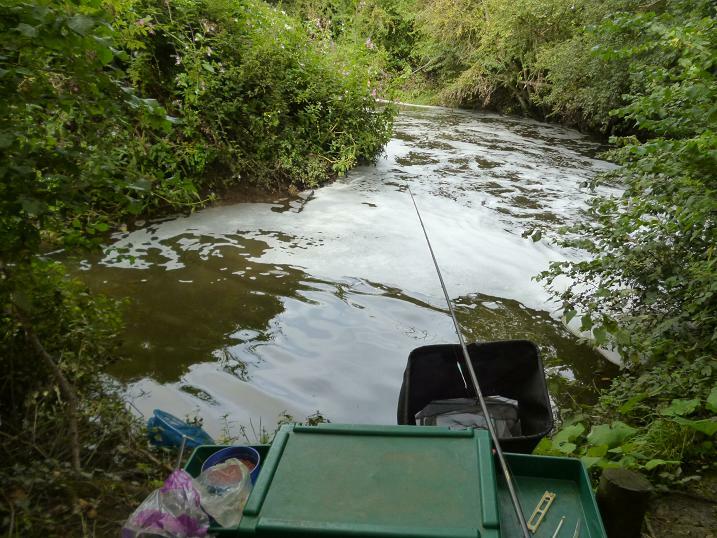 The depth is only about 30 inches and I fed out in front of me, aiming to create a hot spot at the crease, where the fast weir water meets the slower river. First cast in and the float zoomed away as a plump rudd took the two red maggots. A good start, that was followed by three more, then a brief rod bending run from another species, a perch disappearing down the weir stream at speed. I swung in the rudd, but the landing net was needed for this battler, the hook dropping out in the net. The rudd lined up to take, just where the float entered the foam, watching the line movement for a strike, when again another species charged off with the maggots, this time a six ounce chub seeking out the fast water. From now on the chub got smaller, crowding out the better fish. 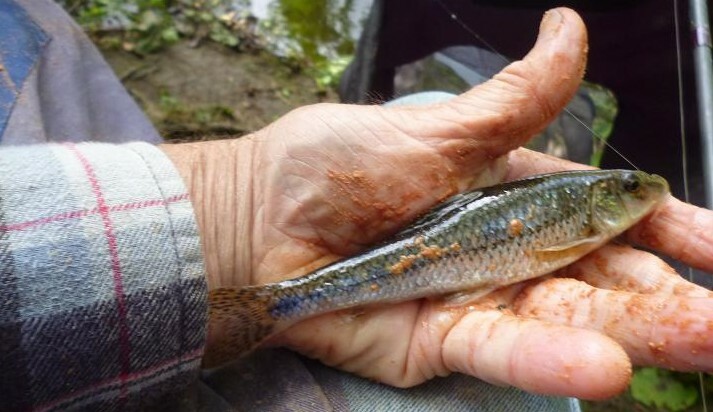 Initially I returned the tiny chub, but decided the only way was to speed fish my way through them, while still feeding every cast. A change to sweetcorn on the hook put me back in touch with the rudd, although the invasion of mini chub were not immune to the larger bait. 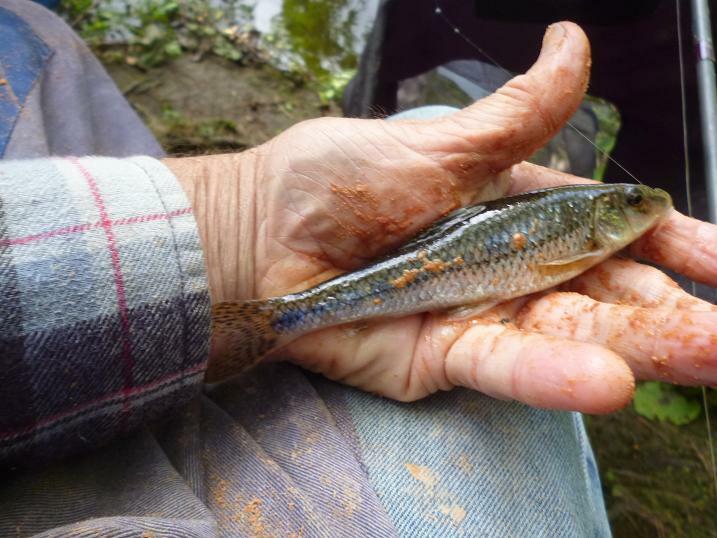 As the chublet threat subsided, gudgeon took their place, when I bulked the shot and laid on over depth, although many put a bend in the rod, as they hugged the bottom. The pace was hectic, as fish after fish dropped into the net, the hot spot almost glowing, there must have been hundreds of fish down there frantically rooting out the maggots from the bottom. The float sank and my rod wrapped round in an instant, as a much more determined fish hooked it’self and ran across the faster water towards the trees, while I back wound my reel furiously to save a break. Running upstream along the far side of the weir, the fish was making for a tangle of branches and I held the rod out across the river, keeping on the pressure, until it dropped back down, around the bend, requiring another quick change of rod angle. Bringing it back upstream on my side, a flash of golden brown scales indicated my waited for carp, but it was not finished yet and made straight for a bush on the corner of the weir, where it managed briefly to loop the line over a sunken branch. 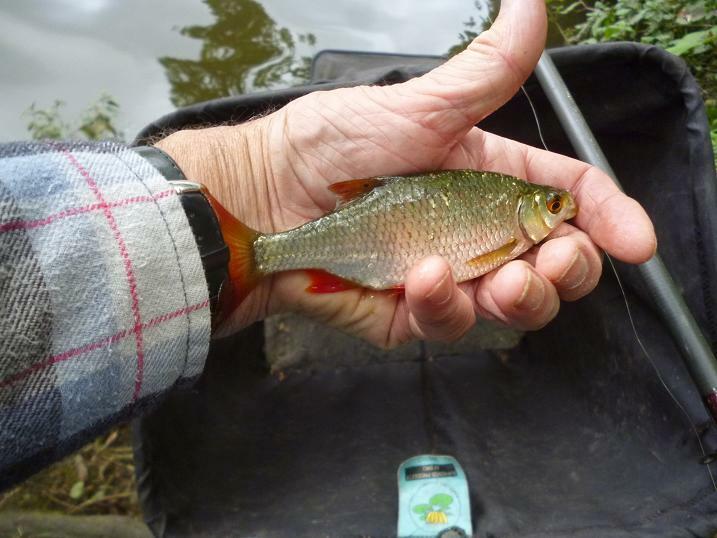 A hard pull towards the slack water and the net, claimed the fifth species of the afternoon, a crucian carp, which on reflection was another feral goldfish, my second from the river this season. 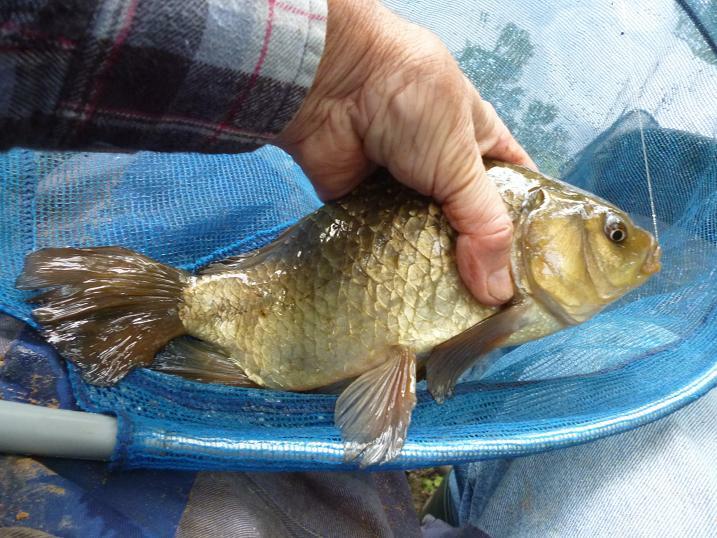 This crucian had taken maggots, but I swapped back to sweet corn in the hope of another, only to be straight into the rudd again, trotting it down the run, holding back hard, they were sinking the float with abandon. Now out of the fridge, the red maggots had begun to turn to casters rapidly and thought that a couple on the hook were worth a try in the hot spot. Bang. 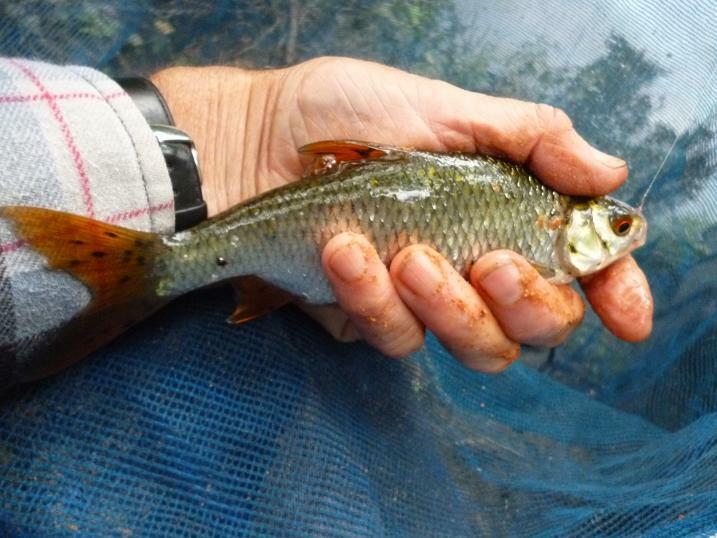 A good roach was pulling hard in the flow, species number six. The hemp and maggot/caster mix continued to go in, every cast was a fish of some sort, I was like a robot, working hard to empty the river. Twice more I hit into immoveable objects, that turned tail and made for the sanctury of the opposite side of the weir pool at impossible speeds, twice my 3lb hook line parted like cotton, despite an instant back wind of the reel. The compensation would be another roach, rudd, or perch next cast and I kept at it until the maggot box was empty, a look at my watch indicating under four hours of fishing, that had passed in a blur. A true mixed bag from a small river not given a second glance by most who drive by, on this occasion spinning the dial on the scales beyond 11lb, before being slipped back into the water.